You can listen to the podcast directly here or subscribe to Bina007 Movie Reviews in iTunes. The next step in my retrospective of British horror director Ben Wheatley's career is the 2011 film, KILL LIST. George Ghon reviewed the movie for this blog, but this was my first time watching the movie, and boy was I in for a shock. As with DOWN TERRACE, the first part of the movie is a quiet, unsettling take on modern suburbia, with snatches of violence occasionally visible beneath the cracks. We meet Jay (Neil Maskell), a British war veteran back from what was obviously some kind of mission gone berserk in Kiev. Jay clearly loves his wife and young son, but he's also clearly got some kind of post-traumatic stress disorder, compounded by his wife putting pressure on him to make some money. She leads him explicitly back into partnership with another ex-soldier called Gal (Michael Smiley) who brings him into the world of contract killing. What I love about this first act is that with Laurie Rose's handheld shooting style and Robin Hill's almost art-house Mallickian editing, combining voice-over or dialogue with a shot of a contemplative character, we get a real sense of intimacy with the family. I also love the foreshadowing - the idea that play-violence is everywhere - roughing up on the lawn, playing with toy swords - but that the real thing is just around the corner. That said, at this stage of the film I thought the hints of cult behaviour were a bit cheesy - viz Gal's weird girlfriend scratching a cult symbol on the back of Jay's mirror and stuffing his blood-stained tissue into her bra. That seemed to me less scary than just embarrassing. In the second act we see Jay and Gal embark on their kill list, and as with DOWN TERRACE, the movie strikes an uneasy comedy-horror tone as their deadpan nonsense banter is interspersed with acts of violence that go from being off-screen and subtly hinted at to more and more explicit. Even worse is the genuinely disturbing feeling that the victims actually want to be killed. This, for me, is where the movie really kicks into gear, just as Jay starts to unravel and we get hints of what may have gone wrong in Kiev. As for the third act, well, I can't reveal too much or else spoil it for you, but suffice to say that it goes batshit crazy in the best way, with cultish violence, third-act reveals of who's pulling the strings. But for a more spoiler-ish discussion of its textured and provocative denouement, feel free to stay listening to the podcast after the show-notes! KILL LIST played the festival circuit in 2011 including SXSW, Frightfest and Toronto. It was released that year in the UK and Ireland, and the following year in the USA. 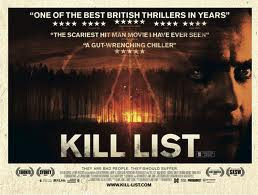 KILL LIST has a running time of 95 minutes and was rated 18 in the UK for strong violence and language. It is available to rent and own.